You are here: Home » We Ain’t Got No Fish! We Ain’t Got No Fish! Pizza. College. They just go together. (Playing the old man card…) Back when I went to college, the food they offered was your typical all-you-can-eat cafeteria style. There were set times and the menu was identical no matter which location you went and if you chose not to eat there, you lost the value of the meal. If you were hungry later, you bought your own. Cash money, honey! Late night meals consisted of Buffalo wings, gyros and most importantly pizza. Like many college campuses, Ohio State had dozens of pizza places that were open late, relatively cheap and delivered. While we had some of the chains (Domino’s), it was the local ones that still stand out in my mind. Donatos – This is a local Ohio State joint that became a regional chain. Known for their edge to edge pepperoni, the draw was much more a local entertainer, Chris Logsdon, playing guitar in the restaurant/bar. Flying Tomato – The closest pizza place to frat row, I recall this much more as a bar than a pizza place. 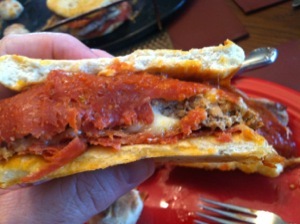 Adriatico’s – Expensive, rectangular, thick and really good. Pistol Pete’s Pizza – This was the first all-you-can-eat pizza buffet I encountered (think Cici’s). It was awful, awful pizza and after the first set of finals when I, and others, went there and studied all day long, eating pizza along the way, they closed up shop. Gumby’s – Gumby’s was cheap. They had a coupon on their boxes that if you collected 10 coupons, you could turn them in for a free large cheese pizza (pickup only). When I was a resident advisor, I would have to conduct rounds of the building where I walked down every hallway of the 11 stories, three times a night, looking for any issues. During each night of rounds, I would walk by the large trash barrels on each floor and invariably find Gumby’s boxes. Each night I conducted rounds I would collect at least 10 coupons! Catfish Biffs – Biffs (whose motto is “We ain’t got no fish!”) has reached legendary status in the minds of many OSU alumni. It was across the street from the dorm where I spent three years and their pizza was always fresh and flavorful. 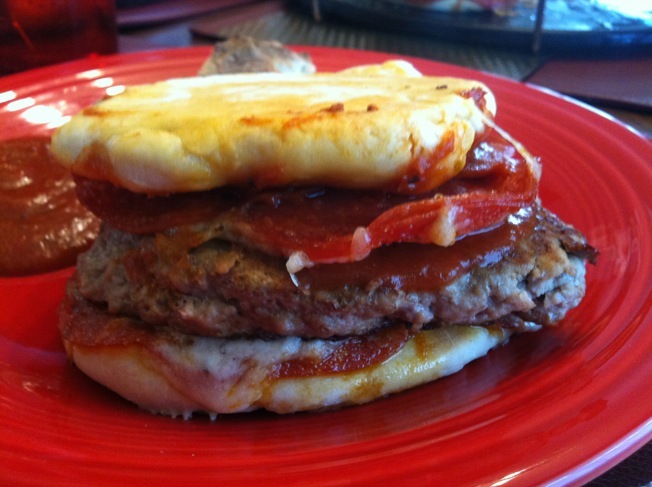 I know I never saw anything as great looking as this pizza burger at any of those places! 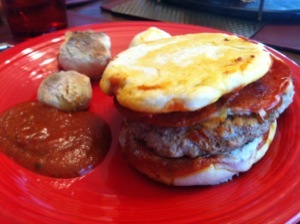 This recipe uses pizza dough to make the buns. What an awesome idea. 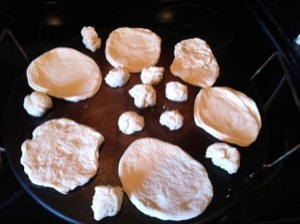 Thaw the frozen dough, roll out some “buns” and bake. I had some left over, I made a few dough balls to dip in extra pizza sauce. 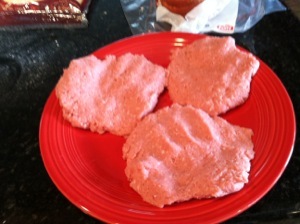 Make your burger patties. I used ground turkey here, but Italian sausage would work well too. Add the toppings and cook. 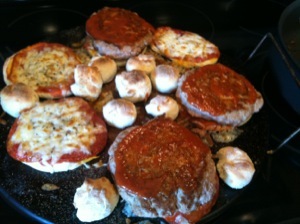 Roll out pizza dough and cut into hamburger bun shaped circles. Bake according to directions. 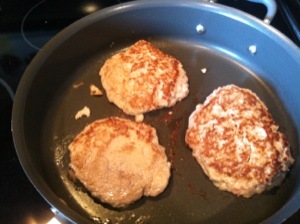 Form turkey into patties and grill or fry until done. 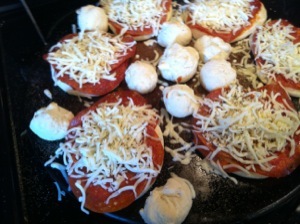 Layer a bottom “bun”, cover lightly with sauce, then 2 slices pepperoni. 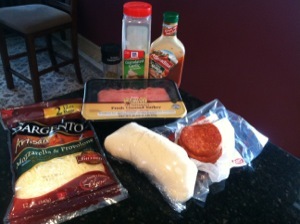 Add burger, more sauce, more pepperoni and cover with cheese. Top with “bun” coated on bottom side with sauce.